© Jeanette Crews Designs, Inc. 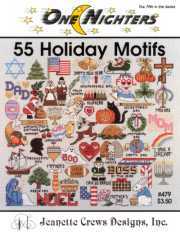 This pattern is 55 Holiday Motifs and is from the One Nighter Series published by Jeanette Crews Designs. Download Only: $3.99 You will download the pattern. Nothing will be mailed, so you pay no printing or shipping charges. Printed: $5.99 We'll print the design on 32lb paper with color backstitching and black & white symbols and mail it to you. S&H charges will apply. With Supplies: $29.54 We will ship you the printed design, 24 skeins of DMC Floss & Wichelt 14ct. 18" x 21" Aida (Ivory) to complete your project.